These unique forest table lamps feature designs by artisans from all over the world. 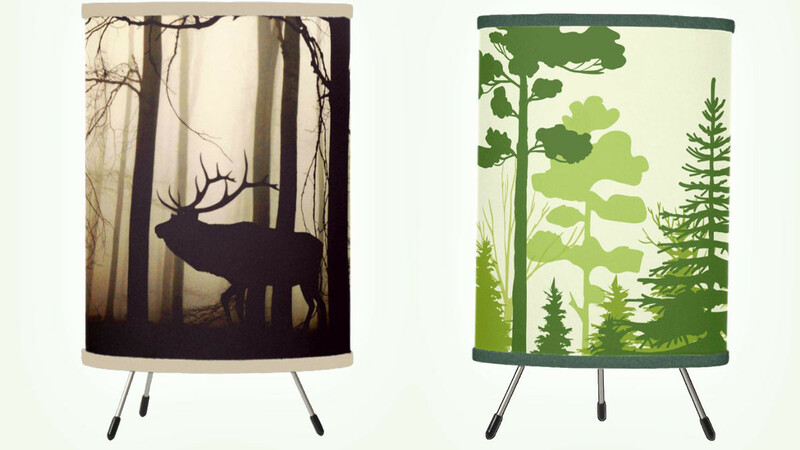 If you like to have a touch of nature inside your home or office then these beautiful lamps are a great way to do that. We don't all have the time or the inclination to take care of indoor plants and these lamps are a cool, modern alternative. The designs on the lampshades are printed using vibrant ink that is fade resistant. If you enjoy artwork but don't have a lot of wall space then a lamp is a great way to add a unique touch. This table lamp features rustic colors and an image of a dark tree-lined road. When lit it is very effective and you can choose from a tripod style lamp as shown or a standard table lamp. This beautiful lamp is perfect for anyone who loves nature and animals. A great idea for the office, the den or for a holiday house by a lake. Perfect for a hunting lodge or as a statement piece for the office. There are many matching products available that feature this same design. This lovely design features a country house in the woods. There are woodland creatures in the foreground that add to the appeal of this design. You can order this lamp as a table lamp or as a lampshade for an existing pendant light. If you like a modern style then this lamp is sure to add a touch of nature to your decor. The colors are bright and it is a great statement piece that will stand out in any room. Use it to add color to a bland room or to add an extra accent to a colorful room featuring green or indoor plants. This design has a somewhat magical appeal associated with fairies or other mystical forest creatures. The image used is a photograph that seems to capture the spirit of a dark and beautiful forest. This forest table lamp features a cool blue tone that is sure to add an interesting element to any room. Use it in a room that already has blue decor or in a blank space to add color and interest. When ordering you are offered a choice of a polyester shade or a premium linen shade. This creative, modern design features a white ghost forest and a softly colored background. The autumn tones are perfect for any room that features neutral colors. You can also order this design on several other matching products. The matching products that are offered include throw pillows, mousepads, and clocks. This beautiful lamp has an image of two wolves in a forest. Many people see the wolf as being a spiritual animal and if you are one of them you will love this lamp. If you know someone who loves wolves this lamp is a very cool gift idea. There are matching products available such as candles, mugs, and night lights. Celebrate the colder weather with this beautiful snowy forest table lamp. It looks great at any time of year and it is sure to suit almost any existing decor that you have. Perfect for a room with a fireplace or somewhere cozy. This is a creative design that shows a moose against a backdrop of a forest. Several shades of green are incorporated so it is sure to look good in any space that has existing green or brown tones. This forest table lamp is a unique work of art that is sure to stand out. This table lamp features a beautiful image of a deer. The beautiful fresh green is a great way to add a vibrant element to any room. Any animal lover or nature lover is sure to admire it. If you like these unique lamps then you may also like to check out the following.